The original game, for 2 to 4 players, which has become a classic board game throughout the world. It is comprised of a square board containing 400 squares, and 84 pieces made up of small squares. Play it with your family or among friends: with Blokus Classic you are guaranteed to have fun moments that challenge you and make you think. When it is played by four people, the game is very animated and the outcome is never certain! Played by two people (where each player has two colours), the game provides the opportunity for more strategic and careful thinking. The game is very simple to understand and to master and is the best product for beginners and for young players. It is also an ideal Christmas present. Enter Blokus, where crystalline polyominoes of red, green, blue, and yellow vie for a place to belong – solid piece clicking upon solid piece, trying to fit in a world that’s just too small for the four of us. In a 4-player game, each player starts with a pool of 21 pieces of their color. The pieces consist of polyomino shapes (specifically, all free polyominoes composed of 1 to 5 squares) – as seen in and popularized by Tetris. To start, each player picks a corner of the 20×20 board and places any piece that occupies that corner cell. Play proceeds from then on, turn by turn, and each player places a new piece, any new piece, from their pool. -and must not come in adjacent contact with any existing pieces of your color. The above link is a great illustration of the catch at work (image by user “WRS WRS” in BoardGameGeek, all rights his). And of course you may not try to fill in an occupied cell. Eventually the board fills up until no one else can place a new legal piece. For every piece they have left, players get -1 points for every square in them (e.g. a 2×2 square piece = 4 squares, -4 points). No pieces left? +15 points for you. The last piece you placed was the single square piece (the “monomino”)? +5 points for you. Player with the most positive score wins the game. Teaches in less than 5 minutes, very easy to pick up, and amazingly eye-catching and attractive, Blokus is a very very accessible abstract. Hence its frequent designation as a family game or a gateway game. But there is amazing depth in Blokus not apparent in its pretty colors. Every piece placed down becomes increasingly consequential as the game progresses, as they determine possible future placement paths and available space – resulting in a highly territorial game where the demand to expand and the defensive instinct to block other colors from encroaching pristine territories you have designated for your future pieces strike a balance. Your choice of pieces matter, and the choice of orientation with which to place those pieces matter even more. As space is consumed guessing other players’ priorities matter – will they expand that way or consume that reserved space next turn? Is using the single-square piece to sneak past this barricade right now worth it? Or should you just take another route to save the single-square piece for a future, safer encounter? Or better yet keep it until the very end for a +5 boost to your points? That being said, how much it burns your brain is entirely up to you. It is very possible to play the game purely on instinct and have a great time making your way through, blocking other players on will, and painting the blank canvas of a board with your color as you do. The game allows you to have that joy in the same game as heavier strategizers. Indeed a table of 4 will very likely contain a good mix of both types, and there is territorial fun to be had on all sides either way. A player performing poorly does affect the game as the board becomes free-er for everyone else. But after a game or two players quickly catch on to the meta-strategy, easily solving the problem. The learning curve is a gentle, inviting slope – but one that never stagnates to a dead-end as even veterans are always on their toes, faced by numerous fresh possibilities. It is, in fact, very hard to come up with a similar end-board twice if not done on purpose. Even when playing against the same players who always go for the same strategy, switching the relative positions of the players go a long way towards creating new balances and equilibrium. Replayability is very high. Hard to have a “bad game” as no luck is involved (it’s an abstract). Unless 3 other players gang up to block you that is, but that’s a meta problem more than it is a game problem. If that is a definite no-no for you, the 2-player game is unaffected by diplomacy and brings the strategic element up by multiple notches, something that is likely more to your fancy and works amazingly well though makes for a different experience than a 4p game. Fantastic solid crystalline pieces, and a board where the pieces click firmly. Pieces are durable and highly attractive. Board is spacious and occupies just the right size as a table centerpiece. Not too small and not too large, the right balance between portability and a magnificent haptic experience. The board starts with a dull grey but ends with a splash of vibrant colors from all the pieces, and gives you a certain satisfaction knowing that you helped paint this canvas into a work of art. Always pretty to look at and fantastic to admire. For this reason Blokus is additionally a plus in helping to attract and ease up friends & family into modern boardgaming. Plays everybody and checks all the boxes – satisfying aesthetics, strategy, accessible complexity, short playtime and low downtime. As an abstract it is themeless, but evokes “territorial conquest” and “strategic placement” as a resounding element very strongly though not in a heavy-Euro kind of way. Not cheap but not pricey either, easy and satisfying to get many plays and thus provides great game value for your money. A definite recommendation. Blokus is a fun game that I would best describe as a puzzle styled game. At first look you would think Tetris the Board Game, but that it is not. The game is plays out very simply with two to four players. One of the first things that you will notice about this board game is that the production is very high. The pieces and board are made of high quality plastic that work great with one another. When you place a piece on the board it fits nicely into its slotted place on the board. Big plus! Game play is pretty simple. Starting from a corner of the board you place a piece and continue in turn laying pieces corner to corner. No flat side of your color piece can touch the flat side of another piece of yours. Through this you will spread your colored pieces across the board, usually into the middle and onward into your opponents hopeful territory. Eventually you will work you pieces to a point where there are no moves left. Once all players have done this the game will end with a fight to the death with your only weapon being your final piece! I have been most victorious with the cross that I like to use as a ninja star. If you don’t like that ending and want something more family friendly then the end goal and winner is the player with the least pieces left. The game looks great with quality pieces and is pretty inviting to many types of players, even those who do not play games. It can be learned in a flash a provides with a unique style of strategy. The game does not get very deep and may be repetitive. Also, for some reason it stresses me out. Overall, it works nicely in the niche I play it the most, with the extended family over. For what it is as a puzzle game I would give it a 7.5 out of 10, in the broad scope of all games I would like to play I would list it as a 5 out of 10. One nice note, the mobile game is a quick pace version I think for .99 that can entertain for a good amount of time. The graphics are not that great, but the game is still fun. I actually like it better as a mobile game, most likely because I can play a few games in the time it would take to play one board game and get my fill faster. I can’t believe what I’m seeing ! The first time you see Blokus, it’s difficult not to fall in Love with that game. The simplicity of the rules, the retro Tetris design for the tiles, the colourful aspect of the board when you are playing your electric tiles… you think life is wonderful. Then you start the game and you enjoy every single move, you feel really excited about what is happening. My wife and my two daughters are enjoying the game too. What more can you ask for? Life is really wonderful. I don’t want to spoil the party but… I lasts two games. I don’t know why this magic fades that soon. Maybe because you feel like always playing the same game again and again, it gets repetitive very soon, … the lack of interest while you are playing it. It’s like you really control less the game than you think. The absence of depth as someone has said. The fact that even kids doesn’t find that it has a pleasure gameplaying… and the fact that this isn’t a cheap game (I think it really doesn’t carry what it costs). The real fact is that nobody at home wants to play Blokus anymore. There are a lot of games that always come first. I’m still wondering the reason why this game doesn’t work for me and my family. In our opinion, talking in the name of my whole family, this game seems better than it is. While not a “Perfect Lunch Table Game” (a trend I look for), Blokus passes a significant test for social game nights: it holds up to food/drink spills and greasy fingers. I can’t speak to whether the plastic Blokus are or are not dishwasher safe, but I can attest to the fact that four somewhat distracted guys with hands covered in pizza and wing sauce can not, without intent, ruin the components of this game. When a Salad Spinner and some dish soap can completely refresh a game, that’s something special. Which says nothing about how enjoyable this abstract strategy game is — and it is enjoyable. Blokus is a game of spatial expansion. Players use Tetris-like plastic tiles of varying sizes and configurations to spread out and claim board space. Unlike similar tile-placing games, in Blokus you’ll be touching your tiles corner-to-corner rather than edge to edge. This makes the game both visually beautiful and tactically innovative; because no two pieces of the same color will ever form a water-tight blockade, players can weave their placed tiles through and around those of other players. The rules themselves are pretty simple, but it’s the kind of game that you learn gradually. There are strategies and sequences that will help prevent or limit incursions by opponents into areas of the board, but it will take many times playing through the game to get a feel for them. One additional note regarding the rules: While two- and four-player games are fairly straightforward, the game plays a bit differently with three players. I recommend that when learning the game, you stick with an even number of players. 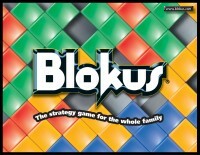 Simple Rules, Complex Strategy, it’s a concept that has led to many fantastic games and Blokus is no exception. It is very easy to learn and plays pretty quick (20 minutes or so) so it’s a great game for non-gamers but has enough strategy to keep avid gamers interested. There are several things to consider before every move in Blokus. Do I want to get get another five square tile down before I run out of room later? Is it more important to block off the corners of my opponents nearby pieces so they can’t build off of them? Should I protect territory that I could freely build in later form my opponents or try and break into their territory? One thing worth noting is that although there are three player rules where each player takes turns placing a piece of the fourth color each round, it really isn’t that great because whoever is opposite the dummy player has a clear advantage. Blokus is still an excellent game that is best enjoyed with four players. My parent’s don’t really play many games. They’re both serious Yankees, Mom works in education, Dad is an Innkeeper. Whenever we go to visit them, this game gets brought out and they turn into giggling fiends. This was one of the first game’s we brought for them to try, and they play it regularly, to the point where it now lives at their house. This is a great game, easy to play and set up. Pick a color, pick a corner, and build for all you’re worth. There is a definite strategy component to the game, which can make it pretty competitive. Winner is the person with the fewest (and smallest) pieces left. There are some shapes that you’ll want to get rid of early, but keep your single square–it’s worth extra points if you clear your pieces with it going last. Fun, fast, easy setup and breakdown, the pieces have a nice bit of weight to them, despite being plastic. I’ve played it with 57 year old Curmudgeon, and a 5 year old distracted by cake. And they both have asked to play it again. This game makes my Dad giggle. And then we played, and fell in love instantly. Blokus isn’t a deep game. It’s extremely simple to learn — the hardest part of it is the corner-to-corner placement of your pieces. As someone raised on Tetris, I still desperately want to make those blocks fit together. But the odd-seeming placement is the crux of what makes the game work: clever piece placement lets you sneak around your opponents and surround them just when they think they have you trapped. It rewards forethought and cleverness, and there have been many times when we’ve found ourselves analyzing the board with all the intensity and strategic gear-turning of a chessmaster. It’s plenty of fun with our crowd. There’s a lot of room for “you magnificent ************ trash talk and grudges/rivalries between us (all in good fun), and it’s not uncommon for players to gang up to contain a perceived threat (usually me, of course). The lightness of it makes it easy for our most casual players to jump in and enjoy, but there’s enough strategic crunch to satisfy our diehard faction as well. The only complaint I have is that if you’re not quick enough and clever enough, or you get ganged up on, you can be knocked out of the game fairly early, and it can be frustrating to watch the majority of the game being played out while you’re hemmed into your own corner with no moves left. But the game time is short enough that it’s not too much of a problem, and the times it’s happened to me I’ve been ready to come back for revenge as soon as the next game starts. All in all, highly recommended as a flexible, light, and surprisingly strategic option. There is just a few rules to this game. Place your piece only touching your previous piece on a corner, and nowhere else. Place your first piece on the starting location. From there, the deceptively simple game goes deep as you vie for control of the board area trying to block your opponents while maximizing the number of your pieces on the board. The game is best played with 4 people, and starts to fall flat with less. With simple rules, a wide range of ages can easily pick up this game. It is well suited for families. *Quick gameplay with little downtime waiting for other players. I purchased this game a couple years ago to teach to my younger siblings/cousins over the holidays. I thought, from all the things I had heard, that it would be a hit with the kids. However, that was only half true. The older kids (ages 10-13) really enjoyed playing and kept coming back to it over the holidays, however the younger kids (8-10) found it to be boring or too difficult for them to grasp and play effectively. I still think it was worth the money I spent, seeing as it did get played a good bit, but it didn’t quite live up to the expectations I had for it. Blokus is a great game for almost any group. It’s very easy to teach to a new player and can be taught in just a few minutes. There are lots of hidden complexity to Blokus that don’t become apparent until you play it a few times. If you know someone who likes Tetris, you have to introduce them to this game. This is a game I invariably pull out for people who are new to “eurogaming”. It plays quickly and gives you a feel for the interest level of the new folks. It is straightforward enough that it is also a good gauge of their ability to learn/retain rules, to see if they have any analysis paralysis, and their competition level. It looks kind of like Tetris, so it isn’t intimidating. A game or two will play quickly and should be fun for everyone. If your new gamers are hungry for more, you as the game “pusher” should have learned a few things about them to help you pick the next game. I like this game for the fact that it can be played fairly quickly but still has enough strategy to it that it is a challenge to get all your pieces down. This is one of those games that is short enough to where if you have a group showing up for a longer game but some arrive early you can use this as a good way to pass the time, or you could pick it up for a game on a night where you just feel like having a game. Blokus is an easy to learn abstract that can be taught in less than one minute. The game looks great as the game progresses and the placement of pieces becomes more difficult. Highly tactical, each player has to react to what the others are doing. At the end, there is always the feeling of “one more time”. This game is an all-around excellent family game. Even my 4 year old enjoys laying tiles, and has won on occasion! This is one of the best abstracts out there. It’s definitely one of the best mainstream games in existence. This game is very simple to learn, but takes a long time to master. Great fun to play with 4 players! This game forces you to think ahead and constantly adjust to other players’ moves. Break through other players’ lines of defense and mess up with their free space. Strategically choosing which block to play next when where to place it will help you win the game! Add a Review for "Blokus"